In this week’s digital news roundup we’re talking updates from the Facebook annual conference, including a revamp of Instagram Explore, as well as Google releasing new top-level domains, and how the government is looking to improve its digital communications. There’s some ‘hot off the press’ news this morning in the world of digital, following Instagram’s announcement that it’s rolling out some new features for Stories. One of the key new additions is the integration of Spotify and GoPro apps, which will mean you can now send content from within these apps to your Instagram Stories. 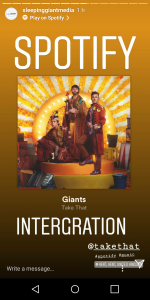 According to The Verge, “the Spotify integration allows you to share a sticker of songs, playlists, or albums you’re currently listening to, with a link to play the music on Spotify”, while the GoPro integration means you can upload content directly to Stories. You then have the option to cut the video, or re-centre, within the Instagram app. The image sharing platform said that more apps will be integrating with Stories shortly, meaning even more opportunity to make your mobile experience as seamless as possible. Keep an eye out for the new AR effects that will be launching in the coming weeks too; celebs and brands will be able to create new camera effects, which users can then ‘try on’ in their own stories. If your inbox has been spammed with as many emails as mine has this week then you’re probably aware that, for many, GDPR prep is in full swing. However, this week saw a study from Enlighten show that many UK businesses are not confident that they’ll be ready for the May 25th deadline. 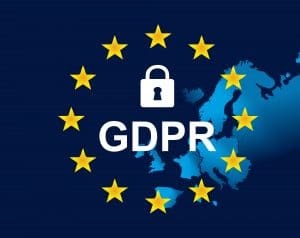 The majority of businesses questioned doubted that they’ll be compliant in time, while nearly one in ten (7%) admitted to not implementing any GDPR-related actions yet. Perhaps it isn’t surprising then that nearly half (45%) of UK businesses have put money aside to cover possible fines. Find out more on the stats at Net Imperative. Nell Sanders, our head of people and resident GDPR guru, said this isn’t surprising: “At the GDPR Conference Europe last year, speakers were all iterating the same thing – the majority of companies will not be ready. For such a mammoth piece of legislation, the advice has been slow to come through, and uncertain at best. However, doing something is better than doing nothing. You cannot ignore this, and there are large penalties for those who do. This month we’re holding our first GIANTtalks event of the year, kicking off with ‘GDPR – it’s a good thing’. Click here to snap up your free place before they disappear! Way back in February, we talked about the infamous Snapchat redesign, and how (despite much protesting by users) Snapchat chief exec Evan Spiegel said it was here to stay. Now it looks like he may regret that decision, with recent reports showing audience numbers are on the decline. 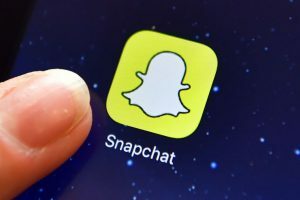 The Drum reported that Snapchat’s number of daily users on the platform had dropped below an average of 191 million seen for the month as a whole, lower than the predicted expectations of 194 million. This is expected to have an impact on share prices, and the company has conceded that growth in the second quarter in expected to decelerate substantially from the first. This doesn’t mean Snapchat’s going anywhere, though (whether you want it to or not…). 4C Insights is quoted as saying that there’s been a 234% year on year increase in ad spend on the platform through their company, while other industry experts praise new features like Lenses for giving users more control. How do you feel about Snapchat? Has it still got a space in the social sphere? Let us know over on Twitter! This week saw Facebook’s annual developer conference take place in San Francisco. At the F8 conference, CEO Mark Zuckerberg announced that they were rolling out new features which would see Facebook enter the world of online dating – using information from your profile to match you with potential partners based on things like mutual interests and friends. Your dating profile would sit separately from your main Facebook, and be invisible to your friends – in fact, you’ll only see suggested sweethearts who aren’t already friends with you. 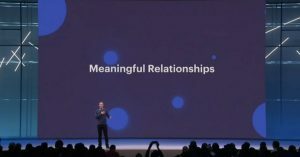 Zuckerberg was quoted as saying that he loves hearing stories of people who met on Facebook and are now married and have families, but the question remains of whether you can manufacture these relationships on the platform – or whether people are just there to share videos of bunnies eating raspberries. Ouch. So, are you planning on using Facebook to find your new love? Instagram’s explore page is a place to actively avoid. Can someone PLEASE explain to me why there is a live birth on my explore section of Instagram??? I follow fashion bloggers and food this is NOT what I signed up for. Well, we’re in luck, as the F8 conference gave Facebook a chance to announce updates to the image-sharing platform – which include a refreshed Explore tab. Don’t all cheer at once. Now, you’ll be able to filter using a list of topics, like ‘photography’ or ‘animals’ – although I’m yet to be convinced that this will prevent the onslaught of animal abuse videos I receive. Journalist Abhimanyu Ghoshal was quoted in The Next Web as saying he hopes that the feature is “supported with either better AI or human curation, so as to filter out posts of poor quality and actually help me find interesting new creators and imagery on the platform” – and I couldn’t agree more. Check out the Instagram blog for more details on the update. In a week dominated by Facebook news, thanks to the company’s annual conference, Google has managed to slip in a little update. After three years of holding its cards close to its chest, the search mega-brand has now decided to let people make sites ending in .app. After forking out $25 million to acquire the top-level domain back in 2015, Google had so far refused to let anyone else get involved – until now. 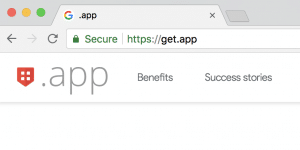 Now, users can register .app domains through Google’s Early Access Program, and from May 7th availability will open to the general public through sites like Google Domains and name.com. It will also be the first top-level domain that requires HTTPS encryption, which could help reduce the 32% of the internet that’s still not fully encrypted. Given the association with the app world, the top-level domain is set to be popular with website makers, as well as other digital designers and coders looking to carve out their brand in a saturated market. Find out more on the story from The Verge. 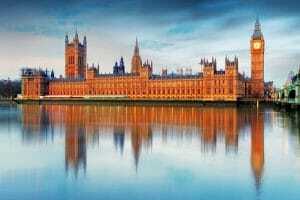 The Government Communications Service (GCS) has announced that it’s looking to ensure its digital marketing is as effective as possible, highlighting “grasping digital” as one of the biggest challenges the department faces. To hit these areas, the government will be running 30 more campaigns than last year, for a total of 143. Aiken highlights how the increase shows that people are understanding the importance of digital work, and how communications are a “powerful force for good”. Find out more on how they’re planning on structuring the campaigns over on Marketing Week. Another week bites the dust. Enjoy the weekend people!